FIVE EQ MODES FOR RICHER EXPERIENCE: Volume-optimized EQ gives you a consistent balanced performance. Match your music with Rock Pop ClassicJazzCountry and Natural styles. BUILT TO STAY COMFORTABLE: The Memory-protein ear cushion simulate human skin texture ensuring lasting comfort. Perfect cover ears the sound of isolation from the outside world let you better enjoy your journey of music. NEVER POWER OFF BOTH WIRELESS & WIRED: 1. The wireless mode: Battery update to 8~13-hr music time/ talking time in a single charge; 2. The Wired mode: you can also use it as a wired headphone with the provided audio cable so the headphones will never power off. HANDS-FREE CALL & BUILT-IN MIC: Please Note: Headphones with Microphone and volume control works both in wireless /wired mode. 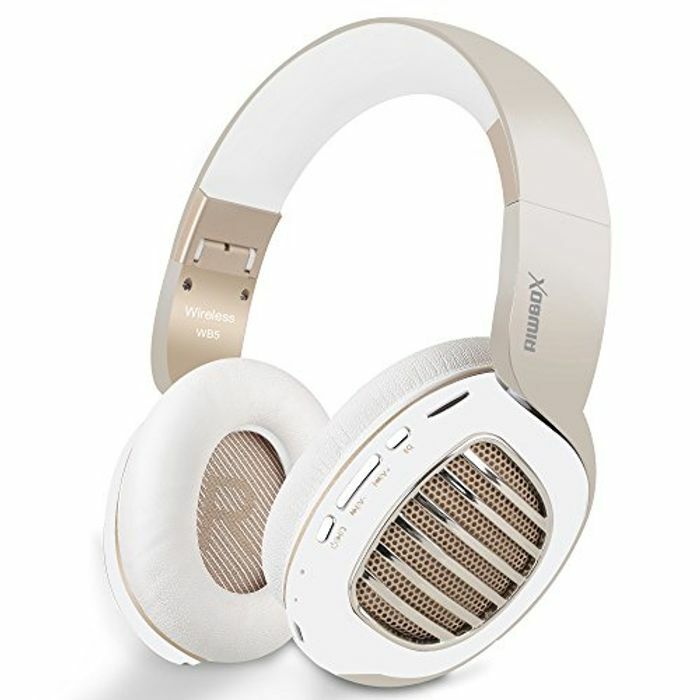 Riwbox Bluetooth headphones provide a quick and stable connection with your Bluetooth enabled devices like cell phones tablets pc TVs within 33 feet with a high-quality built-in microphone for hands-free calls. FOLDABLE DESIGN : Space-saving foldable design not only saves space but also makes it portable. Riwbox Bluetooth headphone WB5 fit the modern city lifestyle for everybody you can bring headphones for work and travel .no matter you are office worker or student teenager or girls. Sorry but am i missing the deal on this one? Regular price and no promotion? There'a 50% promo code but you need to claim it from one of the forbidden sites. MrNE I hope you managed to get something sorted.